After working for decades as vinyl fence experts in Dallas, we’ve heard plenty of myths and misconceptions about vinyl fences. Many people still think vinyl fences are inferior products to fences made from wood or other materials. The truth, however, is that vinyl fences are very far from the cheap “plastic fences” you might be thinking of. Take a look at some of these common myths about vinyl fence and learn the truth about this durable, versatile fencing option. If you grew up in the 60s or 70s, you probably remember people replacing their old wooden siding with fancy vinyl on their houses. And then you got to watch as that siding slowly faded and turned yellow or brown with exposure to the sun, rain, and time. It’s true that old or cheap vinyl fades with exposure to solar radiation and outdoor conditions. However, vinyl produced using modern processes – such as the vinyl we make our fences out of here at Future Outdoors – is very different from those old-school vinyl products. Modern vinyl makes use of special blends of UV protectants and tougher materials to produce a product that never loses or changes its color. When you buy a quality vinyl fence, you’ll get a fence that will keep its amazing good looks for decades. Compare that to a wooden fence that needs to be restained every few years just to look nice. One of the most enduring myths about vinyl is that it becomes brittle and easy-to-break when it’s exposed to cold weather. While this isn’t much of a problem for most of the year in Texas, our occasional ice storms and sub-freezing winters give many fence buyers pause. After all, why would you want a fence that’s going to snap if it gets too cold out? Fortunately, this is one myth that is simply untrue. Vinyl does lose a little flexibility when it gets cold out, but the change is almost unnoticeable. Vinyl fences, much like other outdoor vinyl products, are plenty tough enough to handle wide temperature swings over the course of the year without bending, breaking, or becoming weak and brittle. When you buy or build a fence on your property, you want something that will last for a long time and stand up to years of weather, use, and abuse. It’s easy to think that vinyl won’t be up to the challenge, but you would be incorrect if you did. In truth, vinyl fences are some of the toughest and strongest fences you can buy. While not all vinyl is created equal, a quality vinyl fence will outlast virtually any other fencing material. Because vinyl is slightly flexible, it stands up to impacts from normal use and occasional accidents better than wood or metal. Vinyl also doesn’t rust, warp, or rot – exposure to outdoor conditions like wind and rain will not make it weaker over time. Plus, vinyl isn’t susceptible to damage from insects or pests, either. In almost every way, vinyl fences are tougher and more durable than wood or metal fences. 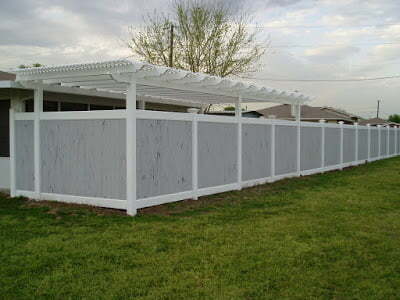 We’re frequently asked by potential customers if they can order a vinyl fence in any other color than white. In the past, vinyl fences did tend to look similar, and it was difficult to get lasting color to adhere to the vinyl. Today, however, this is simply no longer true. Modern vinyl fencing comes in huge array of colors that can match the color of your house or even be styled to resemble wood fencing. Additionally, vinyl fences come in many styles, including privacy, semi-privacy and accented privacy, picket fence, and even ranch rail fence. You can truly get the perfect look for your home, even if you want a very particular style. There’s an unfortunate connection in many people’s minds between plastics and pollution. Many people think vinyl products are naturally bad for the environment, and that wood and other materials are more environmentally friendly. But in truth, vinyl is one of the “greenest” materials you can use for your fencing project. Vinyl takes very little energy and resources to produce, which means it can be made more cheaply than wood or metal fences. It doesn’t require you to cut down any trees – just think of all the forests that go into making wood fences every year! Since vinyl fences last longer than wood fences, they also require less replacement, which in turn means they use even less resources over time. And finally, vinyl is fully recyclable, meaning your vinyl won’t end up in a landfill if you ever get rid of it; instead it will simply become part of something else. If you’d like to learn more about the benefits of owning a vinyl fence, contact us today at Future Outdoors. We’re the vinyl fencing experts in the Dallas, Texas area, and we can answer any questions you have about vinyl fence, vinyl shade structures, or any other vinyl products. Call today at (972) 576-1600 or visit our Facebook or Twitter pages to learn more.